Mourning Cloak, Kosmos Scientific de México, S.A. de C.V. 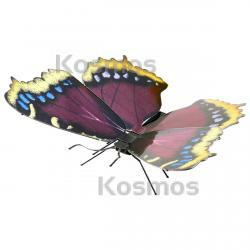 The Mourning Cloak is a large butterfly native to Eurasia and North America. This powerful flier is sometimes found in areas far from its usual range during migration. The Mourning Cloak has a lifespan of 11-12 months, one of the most extensive lifespans for any butterfly. Number of sheets:1 Sheet Difficulty:Easy Assembled Size:L 4" x W 2.25" x H 1.25"